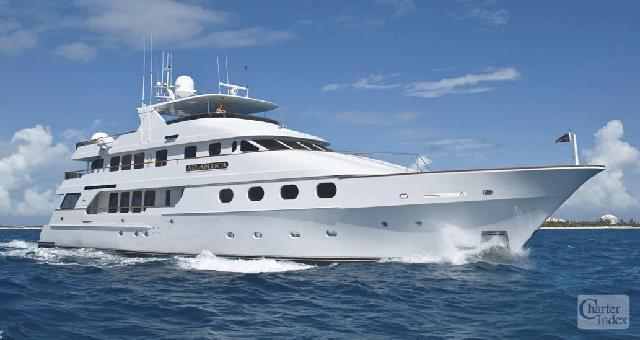 Experience Luxury Aboard Our 135′ Bahamas Motor Yacht! This Yacht can accommodate 12 guests in 5 cabins. MASTER STATEROOM: (on Deck, amidships) King berth, separate seating area/library, dressing room, large walk-in closet, 2 entertainment centers w/TV/DVD/CD/VCR stereo system. Ensuite bath has two TVs, Jacuzzi tub, his & her heads and showers. One shower has steamer and rain dome. VIP STATEROOM I: Queen berth, TV/DVD/Stereo, double door cedar closet, writing desk, ensuite bath with marble double sink vanity, Jacuzzi bathtub, shower and TV. VIP STATEROOM II: Queen berth, TV/DVD/Stereo, double door cedar closet, writing desk, ensuite bath with marble double sink vanity, Jacuzzi bathtub, shower and TV. GUEST STATEROOM: Queen Berth with Pullman, TV/VCR/Stereo, cedar closet, ensuite head with shower. GUEST STATEROOM: Twin berths and Pullman, TV/VCR/Stereo, cedar closet, ensuite bathroom with shower and X-Box. MAIN SALON: 2 Sofas, 2 Chairs, Handmade coffee table, Entertainment center with 36″ Pop-up TV, AVR 5700 theatre surround sound receiver/DVD/VCR/CD/Stereo. DINING SALON: Formal Dining Salon with seating for 12. AFT DECK: 36″ TV, al fresco dining for 12, wet bar, entertainment center. SKYLOUNGE: Formal bar, two L-shaped sofas, personal study. Entertainment center has pull down 5 ft. projection screen and projector, surround sound, 100 CD changer, Karaoke Machine, there is also a 20″ TV/CD/Tuner/Stereo in the personal study. SKYLOUNGE AFT DECK: 36″ TV, wet bar, casual seating with coffee table. FLYBRIDGE: 42″ Drop Down Flat Screen TV, large Jacuzzi with barstools and counters on 2 sides. Wet bar, BBQ grill, large entertainment area and 2 large sunpads aft. Below are some of the upgrades done during the summer 2008 refit. Upgraded AV System with Kaleidoscape & Crestron. New TVs throughout. Added new stonework in all cabins.